It’s so easy to miss a free download or a template so why not have a read below and see if you can find some crafty inspiration! We kick started the summery season with our free paper download, adorned with flamingos, watermelons and more, we really think these designs will make your crafts burst with colour and excitement! Sometimes it’s hard to know what the right words are to say so we thought we would help with our juicy card shape of the month! We took you step by step to show you how to use our free template to create the sweetest surprise. 1 die 3 ways is a great tutorial as it shows you how to use one die set to its’ full capability. This time we used the Dovecraft Feather die for your cards and home décor gifts that your friends will be blown away with! We had a variety of papercraft ideas for Father’s day but we were a big fan of this Simply Creative card filled with yummy sweets that no dad could resist! Now Father's day has passed, this would make a fab craft for the boys in your life! We love washi tape at Trimcraft, so much so that we’ve created a brilliant video tutorial to show you how to use the Dovecraft washi tape range in three, unique ways! The Dovecraft Enamel Effects glues are really versatile and on this tutorial, we showed you two different techniques you could use with this colourful collection alongside two free, silhouette templates! Design team member Katie this month took you step by step on how to create a bright and bubbly layout with the Pick n’ mix designs! The variety of colours will really complement your memories and photos. For those who like to write to their loved ones, we had a fabulous tutorial where we showed you how to create a beautiful letter writing set with our free template and the new Simply Creative Shabby Chic papers. What a month it’s been! 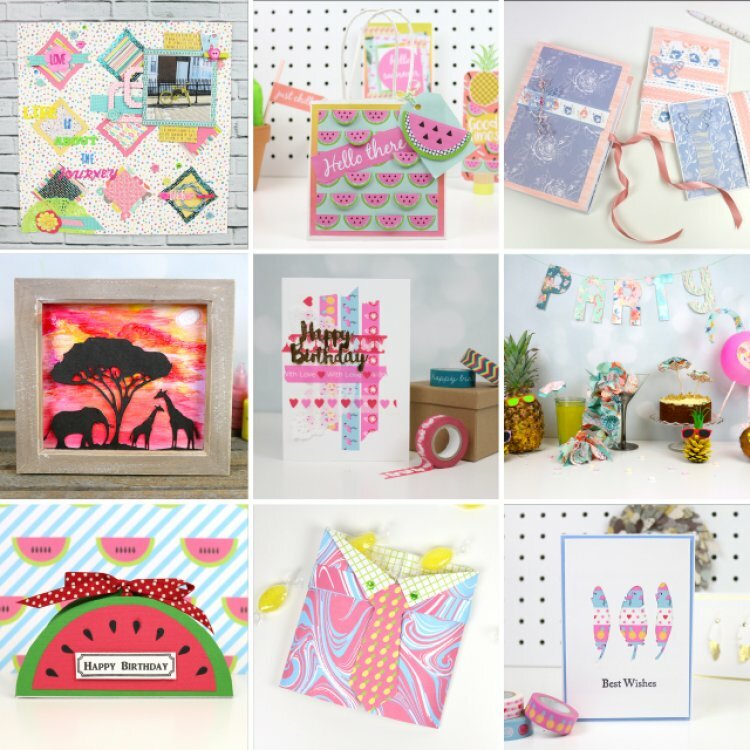 If you’ve been inspired by our tutorials and templates, make sure to upload your wonderful crafts to the project gallery and to #Trimcraft when uploading on social media!